Naturally compact habit is perfect for pot-tight production and no PGRs needed. 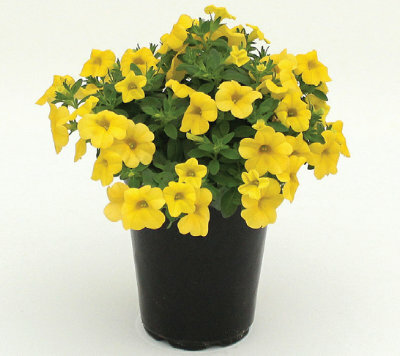 Easy to grow – very uniform. Excellent pH tolerance and profuse flowering give Conga superior hold at retail. Flowers one week earlier than Cabaret Series. 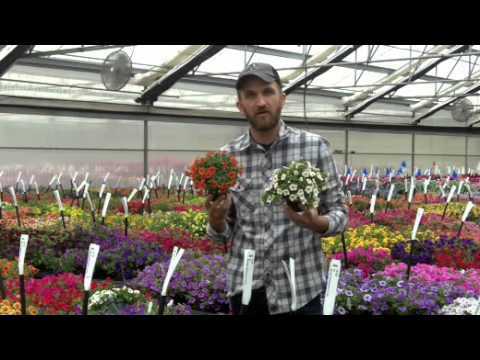 Great choice for quarts, color bowls and window boxes. NEW Light Pink Star: Rose-pink blooms with unique star patterns. NEW Pink Star: Striking pink, star-patterned variety; habit matches other bicolors in the series. 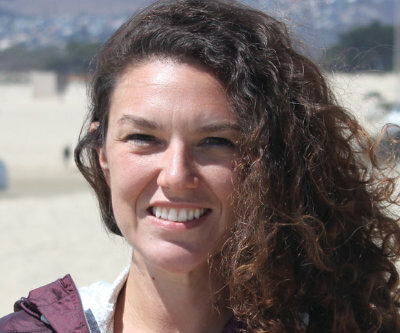 Comments: Avoid wide fluctuations in soil moisture. Apply preventative fungicide drench at 18-21 days after sticking. Plant Growth Regulators (S) = spray / (D) = drench: Plant growth regulators are generally not needed and should only be applied if plants show signs of requiring extra control. B-Nine(S) 1,500-3,000 ppm applied 1 time up to 3 times should provide adequate control. 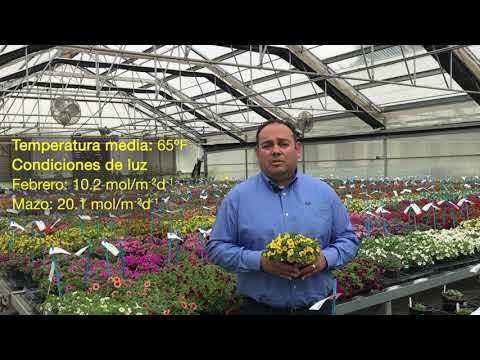 Comments: Cooler air temperatures and high light will reduce or eliminate any need for plant growth regulators. Maintain pH at 5.2-5.8 to optimize plant health. Crop times will be shortest as days lengthen in Spring. Apply preventative broad-spectrum fungicide drench. 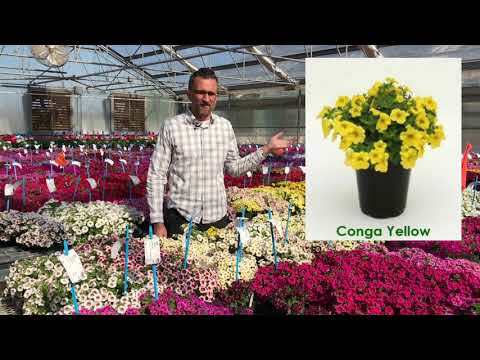 Conga is taking the compact calibrachoa market by storm! Growers find it easy to produce by following these regional tips and tricks. Conga can be grown with no pinch and no PGRs. Growers desiring some control can pinch 2 weeks prior to transplant, followed by a B-Nine 2,500 ppm spray application 5 weeks after transplant. 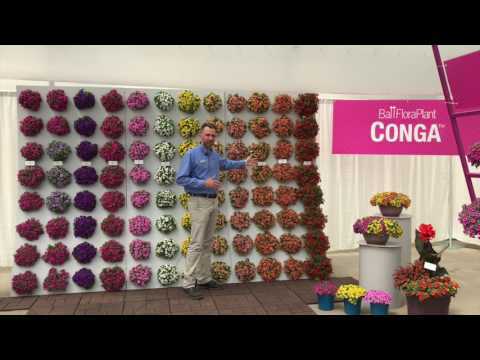 Conga varieties were successfully grown with no pinch and no PGR. B-Nine treatments generally delayed flowering on most varieties. For growers that want to use PGRs, we would recommend applying a late Bonzi 1 ppm drench. Note: Conga Red needs a B-Nine 2,500 ppm spray or Bonzi 1 ppm drench 6 weeks after transplant for a toned plant that matches other Congas in the series. Crops produced for early flowering dates before week 3 in Florida may benefit from light PGR drenches at 0.25 to 0.5 ppm Bonzi.